Here are the promised photos of my new kitchen. Everyone loves a good before and after story. No more telling. I’m all showing! Isn’t this great? This is what we started with. A pretty traditional 60s style kitchen that wasn’t terribly small, but it was a closed off room. Again, typical for back then. 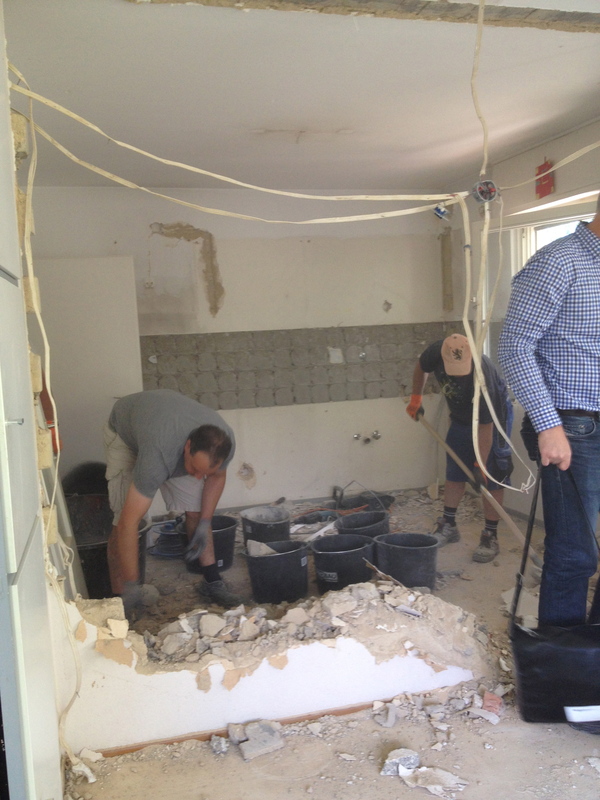 Modern houses are now all about open plan so we knocked down a wall. 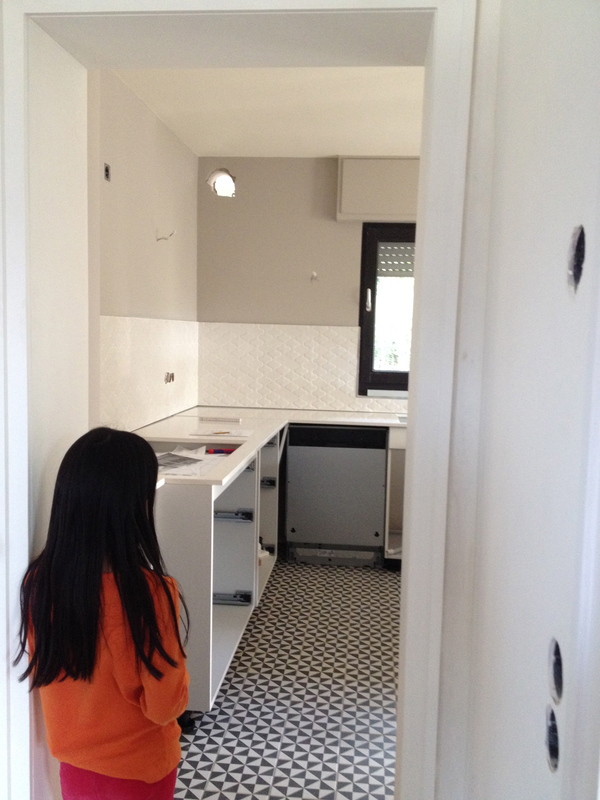 We were actually charmed by the original orange kitchen and even asked our architect if it was possible to repurpose. He said no. 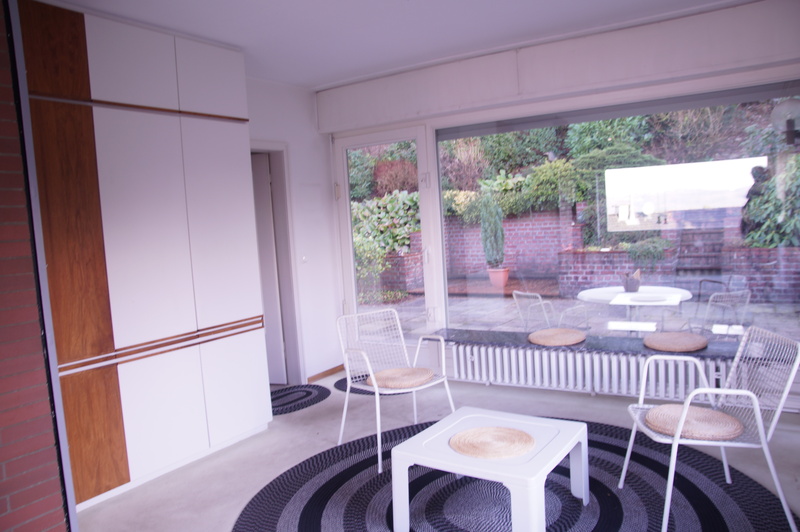 Here’s the adjacent dining area with built-ins that were cute. It hurt to rip them out, but we haven’t looked back since then. Here is the kitchen in theory, all of the surfaces: cabinet, backsplash, counter top, floor tiles. 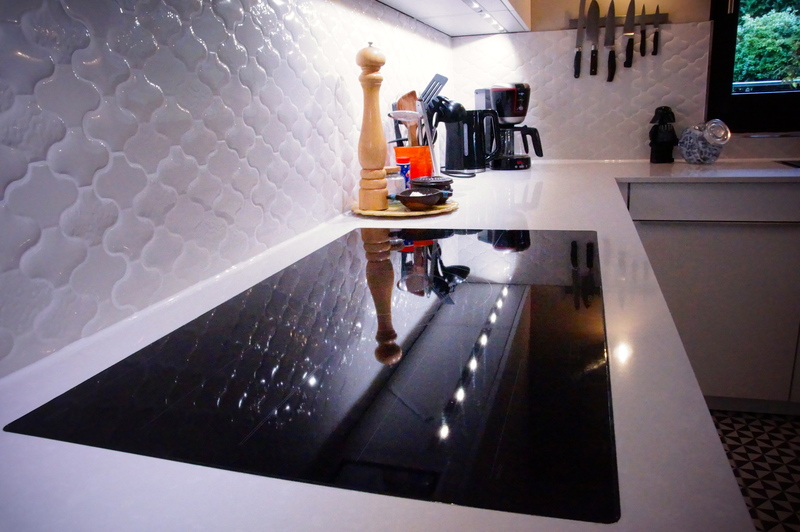 Everything went smoothly with getting the kitchen ready except the backsplash tiles were delayed in arriving. 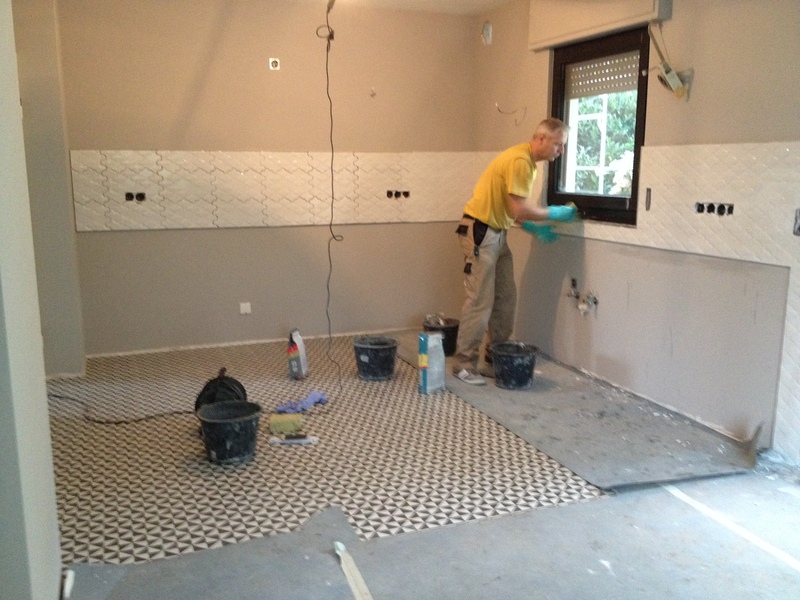 What would a renovation project be like without having to squirm? The carpenters drove up from southern Germany and took a day and a half to install the kitchen. We took a peek as they installed the cabinets. 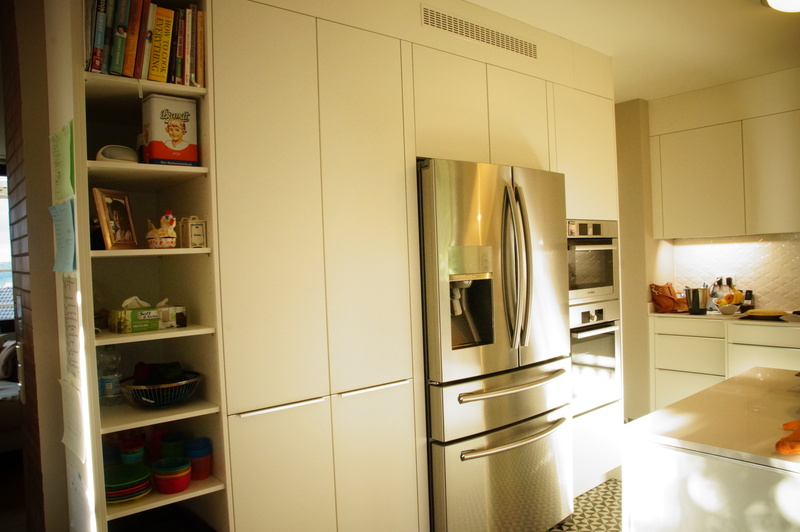 Everything was installed except two cabinet doors and the refrigerator. But look at this awesome cook top. Finally, we can easily fry something in the big frying pan and have a large soup pot on the go at the same time as a few other sauce pans. 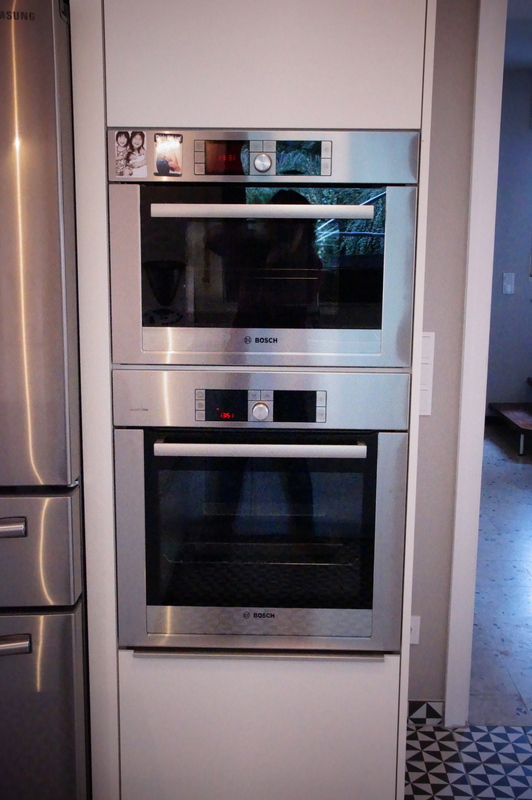 Here are our ovens. We were convinced by Familie Lipp to forego the microwave and get the Dampfgarer. We are figuring it out, keeping the user manual close by, and debating the difference in taste and difference between microwaving and steam heating. If you have any suggestions on how to maximise this device, let me know! I believe it really is a German thing. I decided to take their advice because steaming is healthier than nuking. And here’s the view into the now opened up dining area. There is plenty of storage including for appliances. 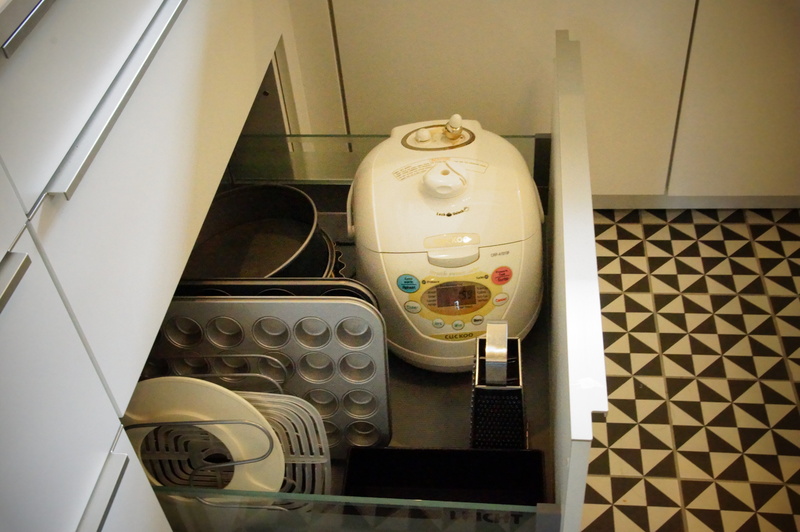 Our Cuckoo rice cooker has its own place in a spacious bottom drawer. Finally, our beloved pièce de résistance, the refrigerator, is in place along with the cabinet fronts which you can just see at the corner of this picture. Everyone loves it! An ice machine and water dispenser are fun novelties for the whole family. Not only can we choose between cubed and crushed ice but also still and sparkling water. This German family is set. 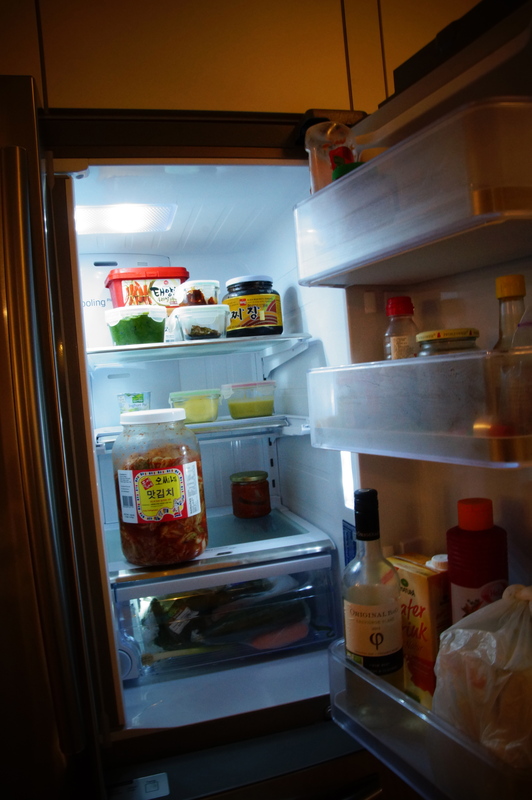 And yes, there is an adjustable shelf to accommodate a tall jar of kimchi. This kimchi was given to us by the very kind people who run Korea restaurant in Düsseldorf, which I will blog about later this month. I transferred it into one of the many jars I shipped over from America. One foot in front of the other, we are settling into our new, nearly completed renovated house. Meanwhile, we are enjoying eating well in our new kitchen. Tags: Bosch, Cuckoo rice cooker, Dampfgarer, Essen, expat kimchi, expat moving, expatkimchi, Jane, kitchen, Korea restaurant Dusseldorf, Leicht Küche, Leicht kitchen, moving, renovating, Samsung refrigerator Germany. Bookmark the permalink. I am particularly envious of your hob – ours doesn’t work properly and it just kills me every evening when I make dinner – but I have to say, most of all I just LOVE your floor! Thank you! 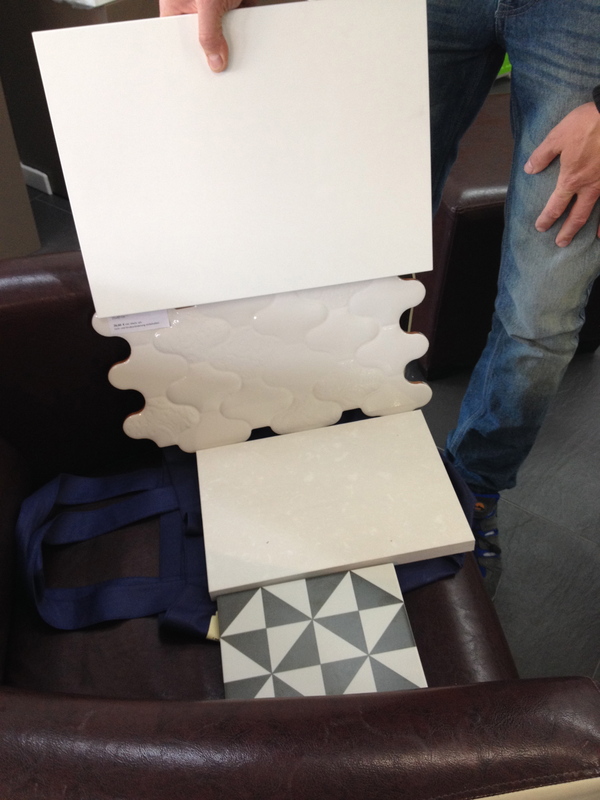 Yes, we knew the floor was a winner from our previous kitchen and were happy to use it again. Having an awesome kitchen does make up for a lot of pain involved with this move. We are all happier for it! I love your new kitchen! And so do, I’m sure. We have a big Samsung freezer/fridge with ice maker as well. I remember being at Media Markt with my husband, discussing the need of the ice maker. Glad I listened to him (the American insisting on the ice maker), because what followed was a heat wave that summer of 2003. Even though we live in Germany, I have never heard of this steam heating device. Definitely better for your health and worth a try. We still use our microwave the conventional way – heating up leftovers and heating pillows. Not good, I know. Enjoy your kitchen, kimchi, and kids! Funny – the ice maker wasn’t so important as just having a water dispenser. I was surprised that my kids like the ice maker again since after enjoying the novelty in San Diego, they got over it after realising they didn’t like shivering when drinking their drinks. My oldest though, now older, seems to be drinking more water right now since she likes it more with ice! So, great – whatever works since it always worried me a bit that she didn’t drink so much. Well, keep an ear out for the Dampfgarer! Thanks for checking in again, Maria! Hi. 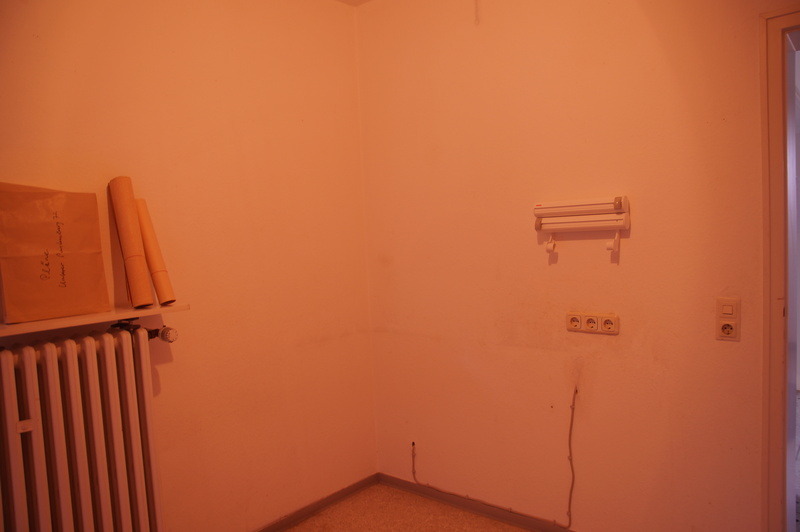 I wonder if I could have your permission to use the picture of the orange kitchen as a backdrop in a video I’m creating? I LOVE your new kitchen! The tiles are gorgeous! One day when I have a place of my own I’d love a kitchen like that. 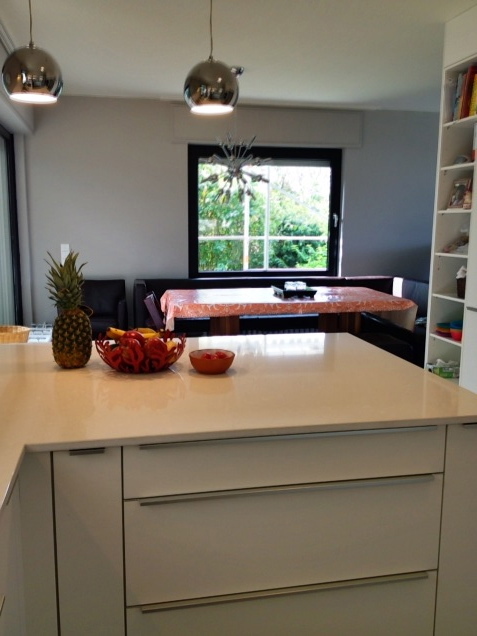 It is Leicht kitchen. I should probably mention that. 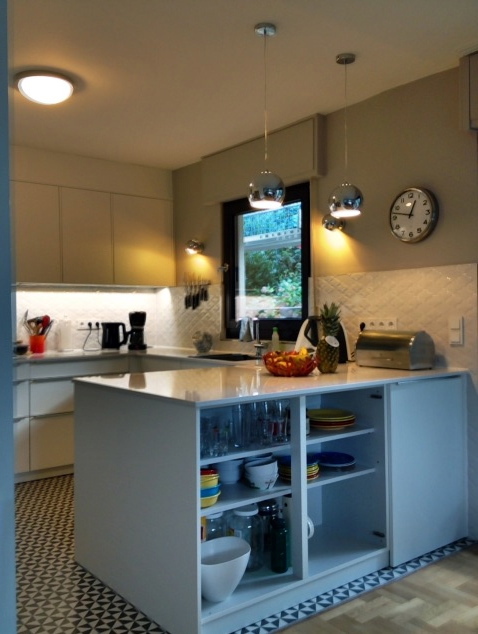 I saw pictures recently of another friend’s kitchen in Germany and I could see a quality difference between materials and layout. What they say is true: it is worth the money to invest in your kitchen and bathrooms. 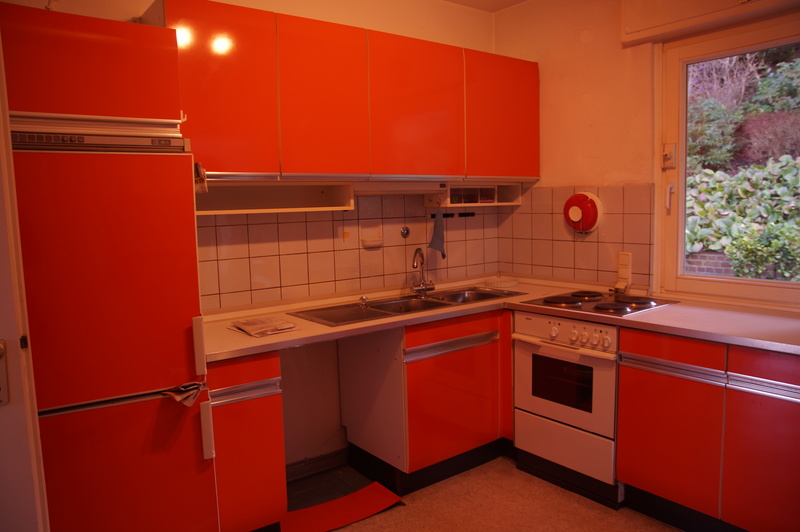 Hello, that Orange/red kitchen you had before. what is the name of it? Hi Sandra, unfortunately I don’t have a name for it. It was the original kitchen and the house was built in 1964.